When an actor dies in middle of the production of the movie, Body Doubles and CGI are used extensively to come alive them on the silver screen. In earlier times, this was the disaster for the producer. But, not now a days. All thanks to advanced level of 3D Animation and VFX (Visual Effects) techniques. Body Doubles and CGI can bring dead actor alive on screen without looking it like fake. Fast and Furious 7 Paul Walker CGI is the hottest amongst all. It is hard to find the difference between Real Paul Walker and Animated CG Paul Walker. Creation of CGI Paul Walker at WETA Digital for the movie is not the first of its kind. It got very much hype due to tremendous success of Fast and Furious movie series. Check out the list of top 10 actors who appeared on silver screen after their death through body doubles and CGI. Director Ridley Scott digitally recreated Oliver Reed who died during production of Gladiator. Digital face was pasted on other actor’s shooting. The biggest challenge was the accurate lip synching, as the dialogues were need to be added. It was blended very perfectly using the visual effects technology of 2000. It was a real tragic. He was killed in accidental prop gun shooting just before three days remaining of the movie. So, for the final movie Alex Proya used digital face of Lee. His CG face was superimposed on the body double actor. The movie was amazingly successful. There was a huge difference of nearby 30 years between the second installment of TRON movie. To make realistic texture, Jeff’s face was taken from the movie ‘Against All Odds’. On top of this, motion capture technique (MoCap) was used to blend 3D face perfectly. The Mill, one of the best Animation and Visual Effects studio, shook the entire world with their Digital Bruce Lee. It was a great tribute to the legend. With the help of Bruce Lee’s daughter, Shannon Lee, the studio did extensive research of nine months to create this mesmerizing output of 90 seconds. The emphasis was more on Animation rather than motion capture. The biggest challenge was the eye animation. The Mill executed this ad for agency BBH in China. Livia Soprano was the character played by Nancy Marchand in HBO series The Sopranos. During the successful running series, Nancy died due to lung cancer. Same like Furious 7, the director David Chase used CGI and her old footages to recreate her for the show. But, unfortunately, the CGI mask didn’t spell the magic of her acting. So, she was shown as she died in sleep in the third season. 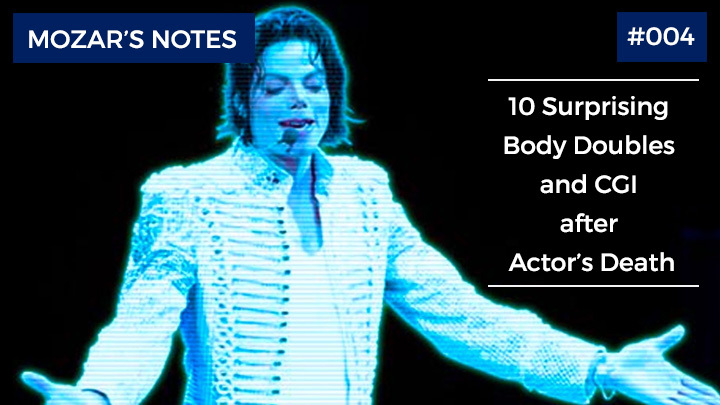 After five years of Michael Jackson’s death, his hologram appeared at the Billboard Music Awards, 2014. It was amazing experience of his fans; the hologram Michael Jackson danced with real dancers on the stage. The tunes were taken from Slave to the Rhythm. The hologram projection used his signature steps along with the famous moon walking. Laurence Olivier died before 15 years of the production of the movie. But, he was selected as the main villain of the film. For the same, many of his stock footages were used from archive, super imposed with electrical effects all over his face. During the 2012 Coachella Valley Music & Arts Festival in Indio, California, hologram of Tupac Shakur and Snoop Dogg performed onstage. Tupac Shakur’s hologram seamlessly blended with Snoop Dogg for “2 of Amerikaz Most Wanted” and “Hail Mary.” And this is not all, the event also featured Dr. Dre, Eminem, 50 Cent and Wiz Khalifa. Peter Sellers is one of the lead actors of The Pink Panther series. Before production of seventh film on the franchise, he passed away. But the director wanted him badly in the movie. So, he used deleted scenes of Peter from earlier movie Pink Panther Strikes Again and body doubles to make his character alive. Larry Hangman is very well known name for his character, J. R. Ewing from Dallas series. He died early due to leukemia. To make him alive on screen again, his unused footages and audio clips were used from earlier series. There is news that he might come back in the next season of the series.